Who could not forget the time of seeing, hearing, or attending a circus. If you were one of the lucky ones to witness the wonder and mystery behind the circus, an event showcasing the most talented of animals, clowns, acrobats, plus many more entertainers, then you had one good time of an experience! What does a circus have to do with "Boxes" though? Well the entertainers need boxes to carry things, store things, all sorts of things can be done with boxes right? Of course I'm right because for one circus' are not just fun but boxes are just as fun! 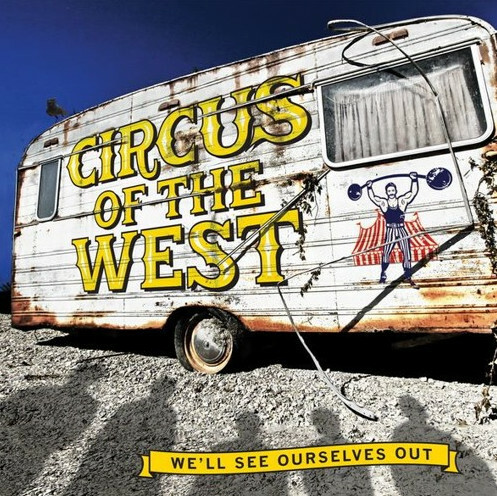 Any who "Boxes", is actually the title of a song, no not from a real life existing circus; but it is a circus in some shapes and forms, the Circus of the West is what they go by as they are an alternative rock band from the Minneapolis area. Their song "Boxes", taken from their debut full-length album "We’ll See Ourselves Out". So you see it is a circus in some sorts. Nonetheless though, Circus of the West has taken their musical direction with pop melodies and rock infused energy, that brings their lyrical content to the front and center of their music appeal. This song as well as the album itself, is filled with such lyrical topics ranging from hope, loss, identity, and connection. It is as the band says a meditation on a journey towards the truth and authenticity of one's life. Frontman vocalist Edwin Caldie had said "This project is about shedding false skin, regardless of social expectations or internal resistance". He's shared song writing credits alongside Joel Levition one of the guitarists off this album. In short really this album is about a mixture of content, "We're seeing ourselves out and inviting others to do the same". It is like this song with its accompanying album is purely timeless and endless pieces of worthy material that all can enjoy and partake in listening to. As far as the song "Boxes" goes, it is an interesting track to sit back and listen to. It maintains that rock energy with those pop melodies the band has gone on about which is nice. Their lyrics rotating around this track in particular is hard to place. It sounds as if the song is about someone wanting to pretend to be someplace or someone else altogether. Showing a whole another life to themselves that they just wanted to fulfill. At least that is what I think this track is about, again not so sure on it. The instrumentation used through this track is upbeat, catchy, really drives the song towards its full focus of appeal, being very attention grabbing. Allowing the instruments to do their parts, the guitar, bass, and drums, working together while the vocals, play out front, the instruments hang back, keeping the track flowing with such energy, it keeps it more entertaining of a beat. That is how this song and its band are as far as their material is concerned. They keep you entertained with their music. "Boxes", off their debut album "We'll See Ourselves Out", is a high ranked track with such force of focus, towards the material itself, it keeps it as a rotation of availability, that can be heard time and time again.